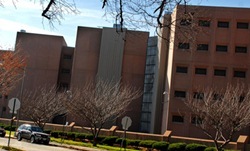 The Central Detention Facility and DC Jail are both located in Southeast Washington DC. These facilities currently house over 2,150 inmates. Inmates housed here have either been sentenced for a misdemeanor, or are currently in the pre-trial phase. Any inmate who is a convicted felon will be transferred to one of the institutions ran by the Federal Bureau of Prisons. The Correctional Treatment Facility is a privately run facility that has been contracted by the Department of Corrections to house both male and female offenders. It is considered a medium security institution, and is made up of five distinctive buildings. You must call 1-888-906-6394 to schedule a visit. You may only call when the visiting desk is open Tuesday-Saturday between the hours of 9am-5pm, alternatively you can schedule a visit online here. Visitation can be scheduled for the following days: Wednesday, Thursday, Friday, Saturday, and Sundays from 11am to 9pm. Visiting closes at 10pm. Money can be sent to an inmate online, in person, over the phone, or through the mail. You will be required to know the inmates name and ID number regardless of the method you use. There is a fee for all methods of deposit. You can also mail in a United States Postal Money order, or can make a deposit in person at the kiosk located in the visitors waiting area. When making a deposit in person you are allowed to use cash, or a credit/debit card. Inmates can make outgoing collect calls, and can also use a pre-paid calling solution. The company that services this institution is Offender Connect. They can be found on the web here. There are certain fee's that are charged for each call and per each minute. You can add funds to the inmate's telephone account by using a credit/debit card. You can get general information about an inmate incarcerated in any of the facilities located in Washington DC by calling the records department at (202)-523-7060. You can also access some information about incarcerated inmates online through VINE available here.